I’ve talked a lot about the importance of prospect tiers when it comes to the NFL Draft. However, to my knowledge I have not yet provided any for this year, so I’ll do that today. The value of this approach is obvious to me and I’ve explained it in detail before. Quickly: Teams have to recognize that there is a significant margin of error in any individual player evaluation. Therefore, saying Player A is a 99 and Player B is a 98, so I should take Player A is complete foolishness. Nobody’s evaluations are accurate enough to allow for that much precision. Again, refer back to your fantasy draft strategies. I’m confident most of you use some form of a tiered approach. Each team can (and should) have their own tiers according to their evaluations and positional values, but the overall concept remains. Now let’s look at the players. First, glad to see Todd McShay has bought in. Here are his top tiers, which can be found at ESPN (you might need Insider to see the whole article). Overall, his take is that if you remove Andrew Luck and RG3, this year’s talent level is no worse than last year, despite what most are saying. A big note: McShay’s ratings here do not match up entirely with the Scouts Inc. ratings on ESPN’s main page. My guess is that the ratings here are updated, but I have no way of knowing that. As a result, the PVM ranks and the tiers below have not been updated with these numbers. 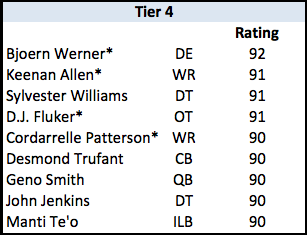 Once I know which ratings are the right Scouts Inc. numbers, I will update the PVM consensus ratings and repost. I will update for changes in the other sources as well so that on draft day we will have an accurate measure for consensus ratings. The good news? Mcshay’s top tier is 4 players deep, all of whom play a position at which the Eagles need help. This means the Eagles can stop thinking and just take whatever player is on the board, ensuring themselves of getting one of the draft’s few elite prospects. Drawing the lines is admittedly a bit subjective; I’ve included the ratings so you can draw your own if you’d like. 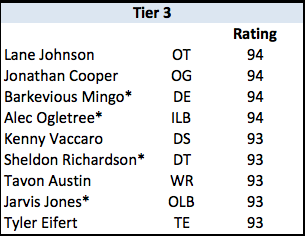 Obviously this set of tiers is slightly worse for the Eagles, since it shows just 2 prospects in the top tier. Additionally, the 4th ranked player is Chance Warmack, who some of us would be less than thrilled with getting. However, I’m getting a bit too deep in the weeds there. The key to this breakdown is the wider view. The idea is that NOBODY has any real idea of who be be the better player out of, for example, WRs Patterson or Allen. The best you can do is make sure you get one of those guys (if you need a WR) while spending as little draft resources as possible. I realize that players at the same position may project differently and therefore be better or worse fits for certain teams. Teams will incorporate “fit” into their individual draft tiers, so the idea still holds. It’s all about recognizing and accepting uncertainty. For example, if there are 3 DEs rated similarly and you can either trade up to #13 to grab the “best” one or stay at #24 and take whoever is left, it’s probably best to sit tight (or to trade up just a couple of draft spots to ensure you get whoever is left). This entry was posted in Draft and tagged elite prospects, nfl by Brent. Bookmark the permalink.